Bacillus subtilis has been widely used as a host for heterologous protein expression in food industry. B. subtilis ATCC6051 is an alternative expression host for the production of industrial enzymes, and exhibits favorable growth properties compared to B. subtilis 168. 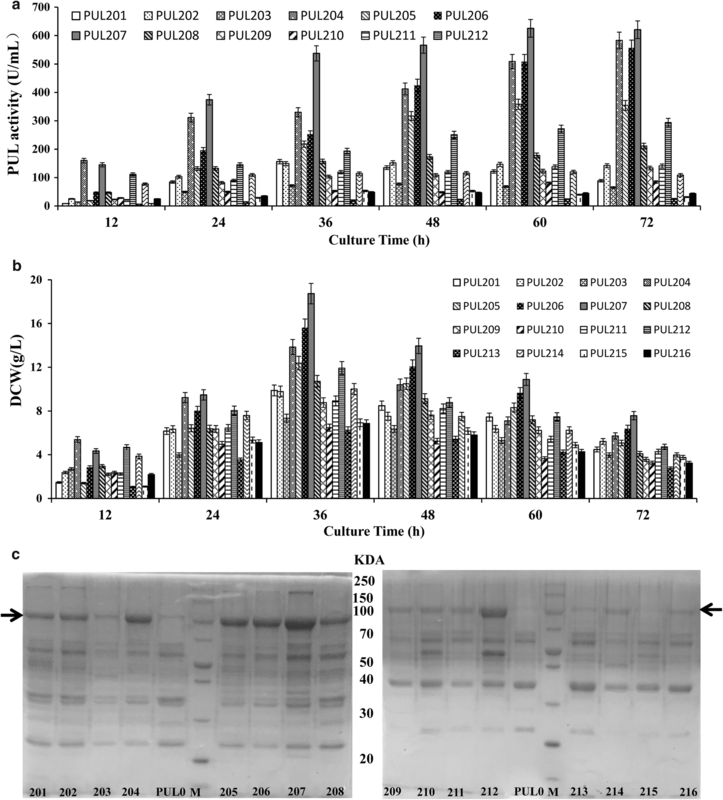 Extracellular expression of pullulanase from recombinant B. subtilis is still limited due to the issues on promoters of B. subtilis expression system. This study was undertaken to develop a new, high-level expression system in B. subtilis ATCC6051. To further optimize B. subtilis ATCC6051 as a expression host, eight extracellular proteases (aprE, nprE, nprB, epr, mpr, bpr, vpr and wprA), the sigma factor F (spoIIAC) and a surfactin (srfAC) were deleted, yielding the mutant B. subtilis ATCC6051∆10. ATCC6051∆10 showed rapid growth and produced much more extracellular protein compared to the widetype strain ATCC6051, due to the inactivation of multiple proteases. Using this mutant as the host, eleven plasmids equipped with single promoters were constructed for recombinant expression of pullulanase (PUL) from Bacillus naganoensis. The plasmid containing the PspovG promoter produced the highest extracellular PUL activity, which achieved 412.9 U/mL. Subsequently, sixteen dual-promoter plasmids were constructed and evaluated using this same method. The plasmid containing the dual promoter PamyL–PspovG produced the maximum extracellular PUL activity (625.5 U/mL) and showed the highest expression level (the dry cell weight of 18.7 g/L). Taken together, we constructed an effective B. subtilis expression system by deleting multiple proteases and screening strong promoters. The dual-promoter PamyL–PspovG system was found to support superior expression of extracellular proteins in B. subtilis ATCC6051. Bacillus species have been widely used for the production of industrial enzymes . Bacillus species are regarded as promising host strains with numerous advantages including: non-toxicity, convenience for gene modification and high yields of target proteins, fast growth rate and low nutrient need . Among Bacillus species, Bacillus subtilis is an attractive expression host due to its desirable features, such as having GRAS (generally recognized as safe) status, naturally efficient secretory system, the background knowledge is available concerning its genetics, physiology and large-scale fermentation processes [3, 4]. Recombinant expression is an important method to facilitate the production of target proteins. Many genetic strategies have been developed to improve the production of recombinant proteins, such as the use of protease-deficient host strains to prevent degradation , the deletion of extracellular protein genes to reduce secretion stress , and the optimization of promoters and signal peptides [7, 8]. Specifically, B. subtilis strains were engineered to serve as extracellular-protease-deficient strains for the overproduction of heterologous proteins such as B. subtilis WB600 , B. subtilis WB700 , and B. subtilis WB800  (Table 1). These proteases-deficient strains were all constructed from the commonly used model and laboratory strain B. subtilis 168 . B. subtilis 168 originates from the Marburg strain, which was deposited as B. subtilis ATCC 6051 (1930) and B. subtilis NCIB 3610 (1951), respectively . Recently, B. subtilis ATCC6051 is an alternative expression host for production of industrial enzymes, which exhibits favorable growth properties as compared to the lab strain 168 . Furthermore, gene expression systems of the genus Bacillus have been deeply investigated at the genome and transcriptome levels [15, 16]. In addition, the highly-active and controllable promoter is an important regulatory elements in expression systems. Recent research has focused on a novel and effective strategy for the identification of active promoters via screening of chromosomal DNA fragments and using a combinatory approach to construct two or more tandem promoters. Efficient expression vectors have been developed with different promoters like the Pr2 promoter of the sigW gene  and the pBL9 promoter of the glvA gene , the dual-promoter PgsiB–PHpaII system  and the PHpaII–PamyQ′ system , etc. Pullulanase (PUL, EC 3.2.1.41) is a debranching enzyme in the α-amylase family GH13, capable of specifically hydrolyzing a-1,6-glycosidic linkages in pullulan, amylopectin, glycogen, and other related polysaccharides . In food industries, there is a great commercial interest of using pullulanase, especially in the saccharification process together with saccharifying amylases for the production of high-glucose syrup and maltose . Over the years, a large number of pullulanases have been discovered and identified from different microorganisms, and have been successfully heterologously expressed in Escherichia coli [37, 38] and various Bacillus species [35, 39]. However, only pullulanase derived from few strains such as Bacillus acidopullulyticus  and Bacillus naganoensis has great commercial value; and the production of pullulanase faces many difficulties, such as the expression levels of recombinant pullulanase were yet limit, low yields and low enzyme activity . As shown in Table 1, the protease-deficient B. subtilis host strains (WB600, WB800) have been explored for overexpressing B. naganoensis pullulanase, but the expression levels are poorer, and cannot satisfy industrial needs. Therefore, the development of an efficient and easy-to-use expression system for the production of PUL is highly desirable. It has been reported that B. subtilis ATCC 6051 could produce large amounts of foam, highly resistant spores, and multiple types of extracellular protease during fermentation [41–44]. In this study, to optimize B. subtilis ATCC6051 as an expression host, eight extracellular proteases (aprE, nprE, nprB, epr, mpr, bpr, vpr and wprA), the sigma factor F (spoIIAC) and a surfactin (srfAC) were deleted. We found that using this defective strain to express heterologous protein production is superior to the common model laboratory strain. Furthermore, we constructed eleven single-promoter plasmids and sixteen dual-promoter plasmids for PUL expression in B. subtilis ATCC 6051∆10. Taken together, we constructed an effective B. subtilis expression system by deleting multiple proteases and screening strong promoters, which has high potential for use in industrial applications. In order to develop the wild type strain B. subtilis ATCC6051 as the alternative expression host with food-grade safety, we used the temperature-sensitive plasmid to inactivate eight protease genes, one spore-related gene and one surfactin gene, yielding the mutant ATCC6051∆10 (Table 2 and Fig. 1a). Eight extracellular proteases (aprE, nprE, nprB, epr, mpr, bpr, vpr, wprA) were selected as the targets for deletion, because previous studies have demonstrated that the use of protease-deficient host strains could prevent protein degradation and reduce the secretory stress. As shown in Fig. 1b, the extracellular secreted proteins increased as more genes were deleted. A sigma factor F (spoIIAC) and a surfactin (srfAC) were also deleted, which affected the production of spores and foam during fermentation, respectively. During the shake flask fermentation process (48 h), B. subtilis ATCC6051 produced much foam and required to add 100 µl antifoam (25%, v/v) every 6 h; the mutant ATCC6051∆10 produced much less foam at a controllable level that needed once antifoam at 24 h. After being cultured for 48 h in LB culture medium, the sporulation efficiency of ATCC6051 was 35.33% (122 colonies/300 colonies), while the sporulation efficiency of ATCC6051∆10 was 0% (0 colonies/300 colonies), which shows that ATCC6051∆10 has great resistant to spore formation. Moreover, the mutant ATCC6051∆10 achieved more extracellular protein production compared to that of ATCC6051 (Fig. 1c). And B. subtilis ATCC6051∆10 (the dry cell weight of 14.7 g/L) grew faster than the wild-type stain ATCC6051 (Fig. 1d). Additionally, the extracellular proteins increased as more genes were deleted, while some ever-present bands showed that there were still intense in ATCC6051∆10. According to the molecular weights of these bands (Fig. 1b), corresponding proteases were predicted as: superoxide dismutase sodA (22.4 kDa), flagellin hag (32.6 kDa), RNA degradation presenting factor YpfD (42.3 kDa), dihydrolipoyl dehydrogenase PdhD (49.8 kDa) and wall-associated proteinWapA (54.2 kDa). Without affecting the normal growth of the strain, we tried to inactivate a gene corresponding to the most obvious protein bands (hag, block mark, Fig. 1b), yielding the mutant ATCC6051∆11: ∆10Δ hag. The extracellular protein became much more obvious, but protein backgrounds of this host strain became much more complicated (Fig. 1b). Therefore, the mutant ATCC6051∆10 may be beneficial for the expression of target proteins, instead of ATCC6051∆11: ∆10Δhag. Obtaining highly active promoters is an effective method for increasing the expression of heterologous proteins. The plasmids, which contained the PUL gene from B. naganoensis ATCC 53909, eleven promoters (Table 3, Eight promoters were from B. subtilis: P43, PspovG, PaprE, PamyE, Phag, Pveg, PnprE and PnprB; PamyL and PglvA were from Bacillus licheniformis; PsigW was from Bacillus amyloliquefaciens) and the signal peptide of amyQ gene from B. amyloliquefaciens (SPamyQ), were used to construct the secretory expression with the plasmid pBE-MCS in the following: pBEPUL01, pBEPUL02, pBEPUL03, pBEPUL04, pBEPUL05, pBEPUL06, pBEPUL07, pBEPUL08, pBEPUL09, pBEPUL10 and pBEPUL11 (Table 4). The eleven plasmids described above were used to transform B. subtilis ATCC6051∆10 in which ten genes were disrupted. The relative strengths of these promoters were determined by measuring the extracellular PUL activities of the eleven plasmid containing strains using orifice plate cultivation. As shown in Fig. 2a, the extracellular PUL activity of strains PUL01 through PUL11 were 72.5, 87.5, 5.2, 4.2, 5.1,3.2, 1.8, 1.6, 25.7, 8.6 and 26.7 U/mL, respectively. Four (PUL01, PUL02, PUL09 and PUL11) of the 11 plasmid containing strains showed higher activity than others, and the PUL02 containing promoter PspovG showed the highest PUL activity. Furthermore, the above four strains with high enzyme activity were expanded in shake-flask cultivation, the cell growth and PUL activities of these strains were compared. According to the results (Fig. 2b), the extracellular pullulanase activities were detected in different phases during the expression process, these four strains reached the stationary phase after 48 h. In the late phase of expression process, the maximum PUL activities were reached 412.9, 340.4, 301 and 159.5 U/mL under the control of promoter PspovG, PamyL, P43 and PsigW, respectively. Meanwhile, the activity of PUL expressed by these four plasmid-containing strains indicated that the vitality effect among these four promoters were: PspovG> PamyL> P43 > PsigW. In addition, the dry cell weight of plasmid-containing strain PUL11 (PsigW) showed the lowest expression level (9.32 g/L) and the plasmid-containing strain PUL02 (PspovG) showed the highest expression level (14.76 g/L) at 48 h. As shown in Fig. 2c, SDS-PAGE analysis of supernatant proteins was carried out to verify these results, and the thicknesses of the appropriate bands (around 100 kDa) were in agreement with the PUL activity values. Having compared eleven single promoters and identified promoters PspovG, PamyL, P43 and PsigW as superior among them, with PspovG being the strongest, dual-promoter plasmids were constructed to further increase PUL expression. To create the dual promoter constructs, promoters PspovG, PamyL, P43 and PsigW were combined with each other, yielding plasmids pBEPUL201, pBEPUL202, pBEPUL203, pBEPUL204, pBEPUL205, pBEPUL206, pBEPUL207, pBEPUL208, pBEPUL209, pBEPUL210, pBEPUL211, pBEPUL212, pBEPUL213, pBEPUL214, pBEPUL215 and pBEPUL216, respectively (Table 4). The sixteen dual-promoter plasmids were used to transform B. subtilis ATCC6051∆10, yielding the sixteen corresponding plasmid-containing strains PUL201 through PUL216. The expression strengths of the sixteen dual promoters were measured using shake-flask experiments similar to those used to assess the single promoters. As shown in Fig. 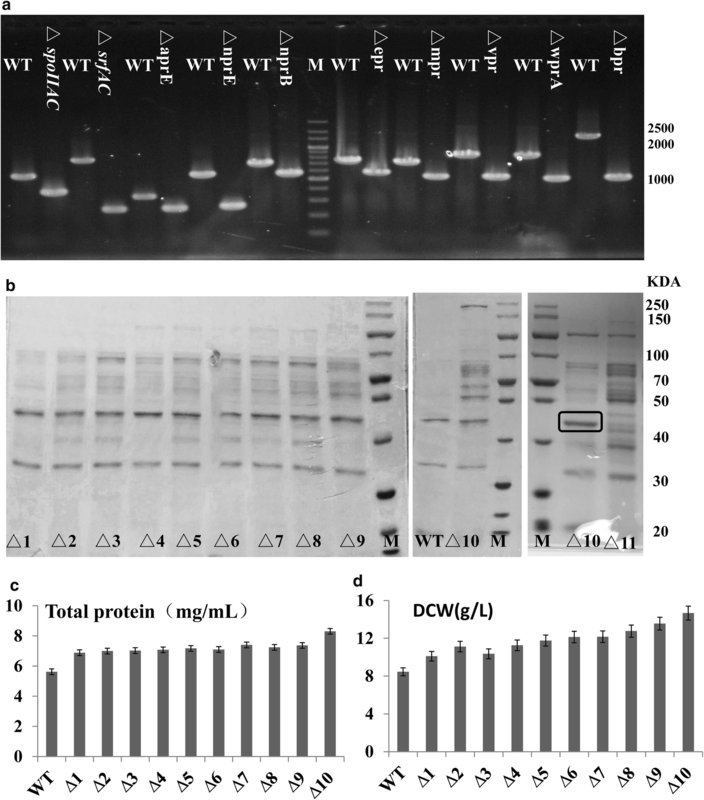 3a, the extracellular maximum PUL activities of plasmid-containing strains PUL201 through PUL216 during the expression process were 156.2 (PspovG–PspovG), 151.7 (PspovG–P43), 77.1 (PspovG–PamyL), 582.9 (PspovG–PsigW), 358.1 (PamyL–PamyL), 556.2 (PamyL–P43), 625.5 (PamyL–PspovG), 210.8 (PamyL–PsigW), 133.6 (P43–P43), 84.5 (P43–PspovG), 141 (P43–PamyL), 293.5 (P43–PsigW), 25.44 (PsigW–PsigW), 119.7 (PsigW–P43), 53 (PsigW–PspovG) and 48.3 (PsigW–PamyL) U/mL, respectively. Obviously, the plasmid-containing strain PUL207, which harbored the plasmid pBEPUL207 with the dual promoter PamyL–PspovG, showed the highest PUL activity. This activity was almost 1.49-fold and 1.84 the activity produced by plasmid-containing strain PUL02 and PUL09, which expressed PUL using the PamyL and PspovG promoter, respectively. Two more plasmid-containing strains PUL204 (PspovG–PsigW) and PUL206 (PamyL–P43) also have higher enzyme activity than the single promoter. Moreover, The dry cell weights of the sixteen plasmid-containing strains peaked at 36 h, and decreased substantially from 48 to 72 h. In particular, the plasmid-containing strain PUL207 (18.73 g/L) was much higher than that of the other fifteen plasmid-containing strains (Fig. 3b). SDS-PAGE analysis of the supernatant of the culture broth also indicated a distinctive protein band at around 100 kDa for the positive recombinant but not the negative control (Fig. 3c), consistent with the results of activity assay. Bacillus subtilis species are usually used as the host strains for heterologous protein expression. However, the host strains can produce many different types of extracellular protease which might degrade the target protein , and many protease-deficient strains display favorable heterologous protein production [43–45]. The multiple proteases-deficient host strains have been constructed, such as B. subtilis WB600, WB700 and WB800 [5, 46]. And the deficiency of proteases genes (nprE, nprB, mpr, vpr, epr, bpr, wprA, aprE) in B. subtilis improved the expression of target proteins obviously. Furthermore, Sigma F, encoded by SpoIIAC gene, controls the formation of forespore . Gutierrez et al. showed that inactivation of sigma F could largely block the sporulation of B. subtilis . Moreover, B. subtilis produces surfactin, an amphiphilic molecule which could accumulate at gas–liquid interfaces and induce foam during fermentation [49, 50]. B. subtilis ATCC 6051 produces a large amount of foam during fermentation, which has an extreme effect on fermentation process control and may lead to contamination . This shows that surfactin may be a major mediator for foam formation, which may affect the protein secretion. In this study, eight extracellular proteases genes (nprE, nprB, mpr, vpr, epr, bpr, wprA and aprE), the sigma factor F gene (SpoIIAC) and the surfactin gene (srfAC) were knocked out to obtain the mutant ATCC 6051∆10. Due to the great demand of industrial applications, the overexpression of pullulanase has received extensive attention in recent years . Among the effective solutions and prerequisites are the selection of new bacterial strains or the improvement of bacterial strains  and B. subtilis strains are well known for their ability to secrete a large number of useful extracellular enzymes . In previous reports, several protease-deficient B. subtilis host strains have been explored for overexpressing B. naganoensis pullulanase, including WB600 , WB800 , and B. subtilis CCTCC M 2016536 (srfC, spoIIAC, nprE, aprE and amyE genes deletion) . But these hosts showed poor expression of pullulanase and the extracellular activities reached 90.7 U/mL, which was the highest ever reported . Secretory expression of PUL was achieved in ten-genes deficient B. subtilis ATCC 6051∆10, and deletion of these ten genes indeed enhanced the production of PUL. This study provided a novel B. subtilis host, which has the potential for the heterologous expression of different proteins. Obviously, promoter as an important regulatory element directly influences the expression efficiency of heterologous protein and strong promoters are usually used to achieve gene high-level expression . In recent years, some previous reports have shown that many promoters in B. subtilis have been used for the expression of B. naganoensis pullulanase. As known, Wang et al. used three widely promoters (P43, Papr and Pamy) to select the best promoter for PUL expression in B. subtilis, and the result indicated that Papr (2.82 U/mL) is the most suitable for the production of PUL. Song et al. constructed plasmids under the promoter PHpaII and P43, resulting in the extracellular PUL activity of 24.5 U/mL (P43). Other studies have shown that two or more tandem promoters can significantly increase the level of heterologous protein expression. Zhang et al. showed that the tandem promoter PHpaII–PamyQ′ (90.7 U/mL) were found to elevate PUL productivity by 1.49 fold compared to the single PamyQ′ (60.9 U/mL) system. Although the above promoters are used as strong promoters in B. subtilis, these promoters resulted in various levels of expression of the PUL reporter protein. In our work, a set of B. subtilis recombinants involving different combination of various promoters were constructed for heterologous expression of PUL from B. naganoensis. Compared with the previous reports, the promoters PspovG (412.9 U/mL), PamyL (340.4 U/mL), and P43 (301 U/mL) can significantly increase the activity of PUL. Moreover, the dual promoters PamyL–PspovG (625.5 U/mL), PspovG–PsigW (582.9 U/mL) and PamyL–P43 (556.2 U/mL) showed the higher extracellular PUL activity than the single promoters. Thus, the above promoter expression systems may have the potential for the production of useful proteins in B. subtilis. In this study, the ten-genes-deficient strain B. subtilis ATCC6051∆10 was obtained by overlap gene knockout. Compared with B. subtilis ATCC 6051, the mutant ATCC6051∆10 had less foam during fermentation under the same conditions, displayed greater resistant to spore formation, achieved 1.48 times more extracellular protein production and 1.73 times more dry cell weight. Then, eleven single-promoter plasmids and sixteen dual-promoter plasmids were constructed and evaluated using shake-flask cultivation. By host strain construction and promoters optimization, the maximum PUL activity of 625.5 U/mL was achieved under the control of the dual promoter PamyL–PspovG. This study provides a valuable expression system with the potential application for industrial production of PUL, as well as expression of other proteins. The detailed information for genes, strains and plasmids were shown in Additional file 1: Table S1, and primers sequences were listed in Additional file 1: Table S2. The following concentrations of antibiotics were used for selection: 100 μg/mL ampicillin (Amp), 5 μg/mL erythromycin (Erm) and 20 μg/mL kanamycin (Kan). Luria–Bertani (LB) medium consisted of 1% tryptone, 0.5% yeast extract, and 1% NaCl, with the pH 7. The flask fermentation medium contained LB medium with 1% corn starch. All the annotated gene sequences of the proteases from B. subtilis were selected from the NCBI database (https://www.ncbi.nlm.nih.gov/), and were used to find the corresponding genes in B. subtilis ATCC6051 by Blast tool (http://blast.ncbi.nlm.nih.gov). The knockout vectors were constructed by a previously reported method , using the mpr gene as an example (pKS2-mpr, Additional file 1: Figure S1). The upstream and downstream homologous arms (about 500 bp) of mpr gene, named mpr (L) and mpr (R), were amplified using the primers of F-mpr-1/R-mpr-1 and F-mpr-2/R-mpr-2 (Additional file 1: Table S2) respectively, and the amplified fragments were further purified and recovered. By splicing overlap extension PCR method using the primers of F-mpr-1/R-mpr-2, the mpr (L) and mpr (R) were fused to form the fragment mpr (L + R), which was then cloned into the pKS2 (5094 bp) at the EcoR V restriction site. Other knockout vectors were constructed following the same method. The competent cells of B. subtillis were prepared by the method reported . The competent cells were electro-transformed at 2.5 kV with 10 μL knockout plasmid solution (100 ng/μL), maintained in 900 μL recovery medium (LB medium added with 1% sorbitol) at 30 °C and 100 rpm for 4–6 h. The cells were spread onto LB plate with 5 μg/mL erythromycin, incubated at 30 °C for 16–24 h, and the transformants were selected by PCR and plasmid extraction verification. The positive transformants were inoculated into LB liquid medium containing 5 μg/mL erythromycin, cultured at 37 °C for 12 h and plated onto erythromycin LB solid medium, which was further incubated at 37 °C to screen the single-crossover colonies. After PCR verification, the positive clones were subcultured in LB liquid medium without erythromycin at 30 °C for 12–16 h. At last, the cultures were incubated in LB plates at 37 °C for 20 h, and each single colony was inoculated onto a LB plate with erythromycin, as well as one without erythromycin. If a colony grew on the LB plate without erythromycin and was inhibited on LB plate with erythromycin, this strain could be the double crossover one, which would be further verified by PCR. The PUL expression vector was constructed based on the pul gene from B. naganoensis ATCC 53909, the signal peptide of amyQ gene from B. amyloliquefaciens (SPamyQ), the P43 promoter and the terminator of amyE gene (TamyE) from B. subtillis 168. First, the fragments of P43, SPamyQ, pul and TamyE were amplified by the primers (Additional file 1: Table S2) and purified, respectively. Second, the purified fragments of P43, SPamyQ, pul gene and were fused by PCR to obtain the P43SPT fragment. Finally, the P43SPT fragment was inserted into the pBE-MCS plasmid at EcoRI and XbaI sites, which was then transformed into Escherichia coli HST08 to obtain the expression plasmid pBEPPUL01 (Additional file 1: Figure S2). Using the In-Fusion HD Cloning Plus kit , plasmid fragment one was joined with promoter fragments PspovG, PaprE, PamyE, Phag, Pveg, PnprE, PnprB, PamyL, PglvA, PsigW and sixteen dual-promoter fragments to yield plasmids pBEPUL2 to pBEPUL11 and pBEPUL201 to pBEPUL216, respectively. According to a previously described method , the activity of PUL was assayed by the concentration of reducing sugars liberated into the reaction mixture and one unit of pullulanase was defined as the amount of enzyme required to produce the reducing sugar equivalent to 1 L/mol glucose per min. Data represent the average of three independent experiments, and error bars indicate the standard error of the mean value. The cell growth was evaluated by measuring the dry cell weight (DCW) . DNA and the proteins were determined by agarose gel electrophoresis and sodium dodecyl sulfate–polyacrylamide gel electrophoresis (SDS-PAGE) , respectively. XL led the design and performance of the experiments, analysis of the data and writing of the paper. HW and LP participated in experimental design and analysis. BW participated in editing the paper. All authors read and approved the final manuscript. The datasets supporting the conclusions of this article are included in the manuscript and additional file. This work was supported by the Science and Technology Planning Project of Guangdong Province (2016A050503016 and 2016A010105004), the Fundamental Research Funds for the Central Universities (Grant Number 2015ZP032), and the Natural Science Foundation of Guangdong Province (2017A030313097). 12934_2018_1011_MOESM1_ESM.docx Additional file 1: Figure S1. Construction procedure of the knockout vector (pKS2-mpr). All knockout vectors were constructed as shown. Figure S2. Construction procedure of the promoter plasmid (pBEPUL01). All expression plasmids were constructed as shown. Table S1. Genes, bacterial strains and plasmids used in this study. Table S2. primers used in this study.